I’ve had three surgeries in my life and my people thought a fourth one would be a smart thing to do. Whaaaa? Nopawdy asked ME! Thanks Travis Ray! If you hadn’t have bloated I wouldn’t have gotten a camera and knife stuck in my belly. But nooooooo. My people learned about bloat and then panicked. 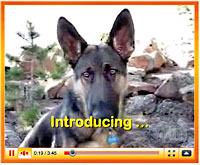 They talked to other panicky smart people who say that a “gastropexy,” which tacks my stomach to my abdominal wall, is a smart thing to do for a German Shepherd like me. Otherwise if my stomach decides to flip over one day, which happens to a lot of Shepherds, I could die within minutes! Well I don’t want to die, I got too much regulating to do. So here I am, zonked out from this surgery AND they even took my right tonsil too! 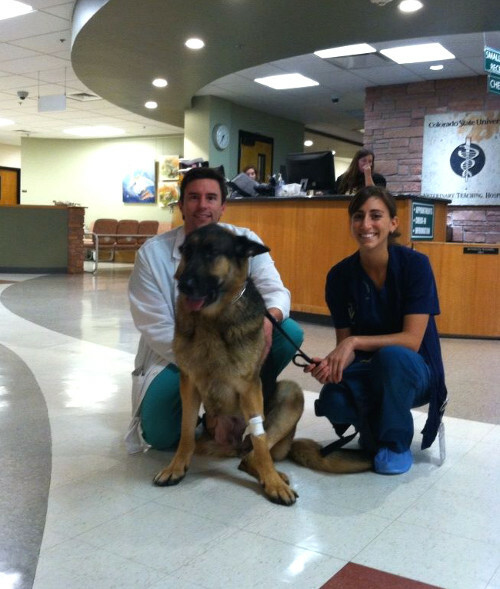 The good Dr. Imhoff and Dr. Smeak and that nice vet student Marcella didn’t tell me they were gonna do that! But it was looking icky and the smarty doctors said it needed to come out. So they did and now my tonsil is in a lab being looked at. Someone said “could be cancer” but I don’t buy it. Cancer, you don’t dare mess with me, got it?! Oh now you listen to me Wyatt, you are one smarty smarty pants DAWG, you are exactly right, Cancer aint gonna mess with you! Jill says to tell you she knows you are JUST FINE and she is very happy your tummy got stapled so you wont bloat. Ohhh Wyatt…..I know you don’t feel good right now…or actually…you might be feeling really good come to think of it! 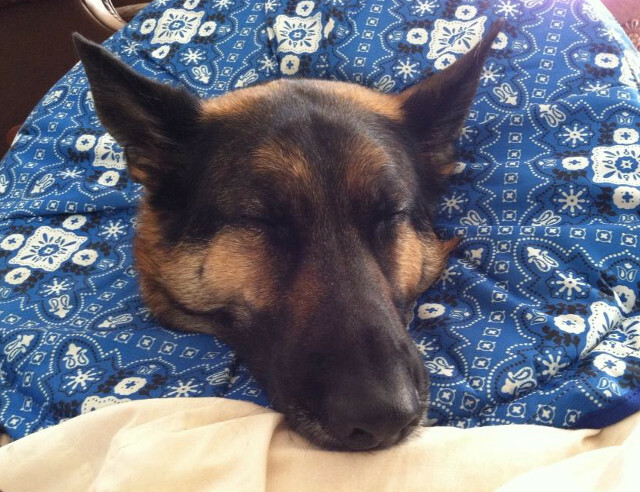 They could have gotten you a more manly pilllow collar though…at least it’s blue! I’m thinking more along tne lines of a tractor tire…. What the heck…taking your tonsil out too? You know ice cream is supposed to help with that type of surgery so don’t you let them try and feed you “dog food”….Ice cream morning, noon and night! Now, don’t be too nard on that “other” Ray Dawg. IF there is something stupid going on with that tonsil..Ray Dawg saved your life yet again! Twice in one operatin! I think you just have been barking so much in your duties as Sheriff, you just blew that tonsil wide open! Boxing up a couple of milk shakes for you right now….WAIT!…. HANNAH! NO! Oops…left them within Happy Hannah’s reach and they’re all gone in a flash…straws and all!! I’ll get you so e more..heading to the ice cream store now and I’ll mail it from there…safe and untouched! Look forward to pictures of you a little less zonked…..a lot less zonked, okay? Wyatt, We are saying a lot of prayers to the big guy to keep that nasty C word away from you. We are keeping positive thoughts & vibes going. Sending hugs (although I know you don’t care for them much). Thank goodness you got your tummy done. We heard that is a nasty thing bloat. Wyatt… rest up buddy and get better soon!!! Let momma and dad pamper you, even though you think it might be girlie getting all that loving attention!! You tell that big C to stay the &*($ away!!! Sending mega vibes and healing hugs…. And we know that you don’t have cancer. that icky tonsil is just there to scare the humans. Like you said, you have way too much to do! Feel better soon, buddy…you’re carrying the Curmudgeonly mantle, you know. It’s a serious responsibility. Wyatt Ray: Crown Prince of Curmudgeonly! And also Pexies and (P)tonsils! What a very smart move by your parents 🙂 hope your feeling better and up on your feet as normal real soon. My Newfoundland has been pexied through the advise of my vet and I’d advise anyone with large deep chested breeds to do the same. Sorry you’re having to go through this, but it will be so much better to not have to worry about that nasty old bloat. I amconfident that ugly tonsil thing is just tonsilitis and that’s my story and I’m sticking to it!! Feel better soon and keep us updated. Oh thank goodness my handsome Husdawg that you don’t have cancer and with your stomach tacked down that just means that we will have plenty of time to spend together sometime really soon! You sure do look handsome with your inflatable pillow! I would like to share that pillow with you! Sending my love for a quick recovery! What is the recovery for tonsil removal and stomach tack? Have you been getting lots of Frosty Paws? (the ice cream for dogs) Love ya! HOLY TOLEDO WYATT RAY!! You sure did have the whole tripawd commnity holding it’s collective breath!!! You had your tummy tacked…and you didn’t even have the bloat! You had your tonsil taken out and you didn’t even have to! You had your little puppy balls…..Oh!…..Wait!……..That was something else entirely!!! Can’t blame Travis Ray for that one! Next time someone mentions “surgery” in your house, run fr the hills!! Soooooooooo glad everything’s okay big boy! “No histologic evidence”; 3 beyootiful words; way to go, Wyatt! I can hear the sighs of relief from your pawrents clear to CT!!!! How ya doing these days, Wyatt Ray? You’re looking awfully relaxed here! Are you back to chasing squirrels yet? Bet so! And how about that tonsil? Whatta know? Any organisms growing in there that shouldn’t be?